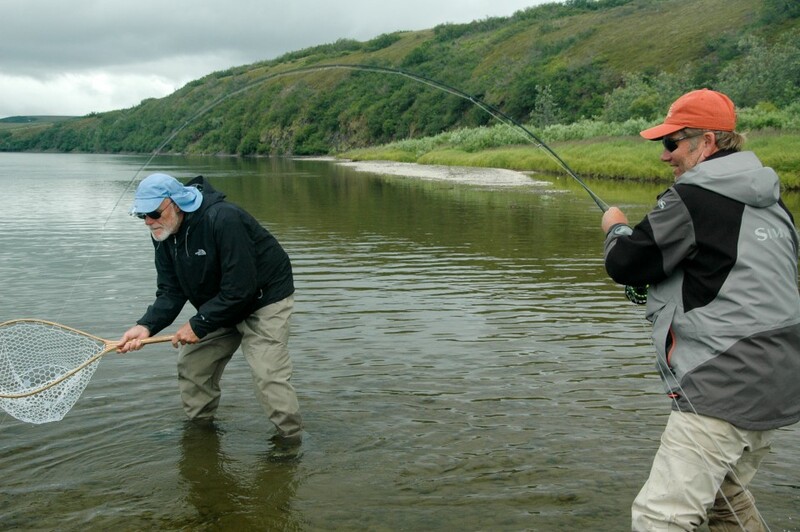 Fly-fishing during the peak of the run on the Goodnews River Alaska. 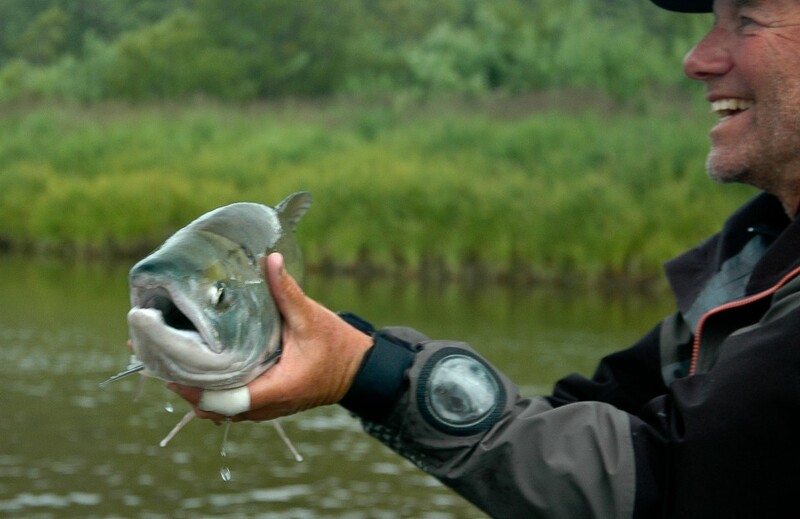 A week that re-defined great fly-fishing. 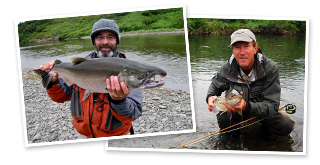 Scott Slappey with his sons Sam & Scott jr joined Gary Smith’s friends (a “loose confederation of Stanford alumnae”) and embarked on what would prove to be the most amazing fishing on the Goodnews River in 2014. 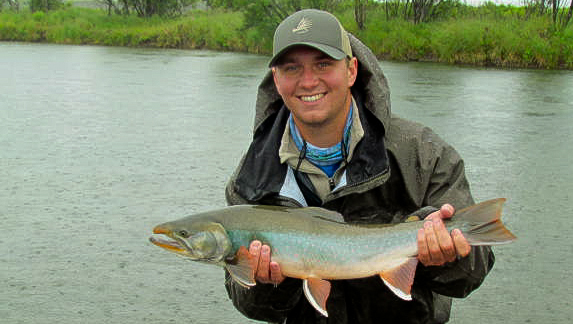 With a “false start” on July 18 due to foul weather followed by a successful “re-start” on July 19 the group ended with several dozen trophy fish released before turning in for the night. The next few days will likely go down in Wild River Guide’s history as the finest trophy Dolly Varden Char fishing in the past decade. Hints of an extraordinary return of super sized Char had surfaced prior in early July but now the magnitude of the run was evident. 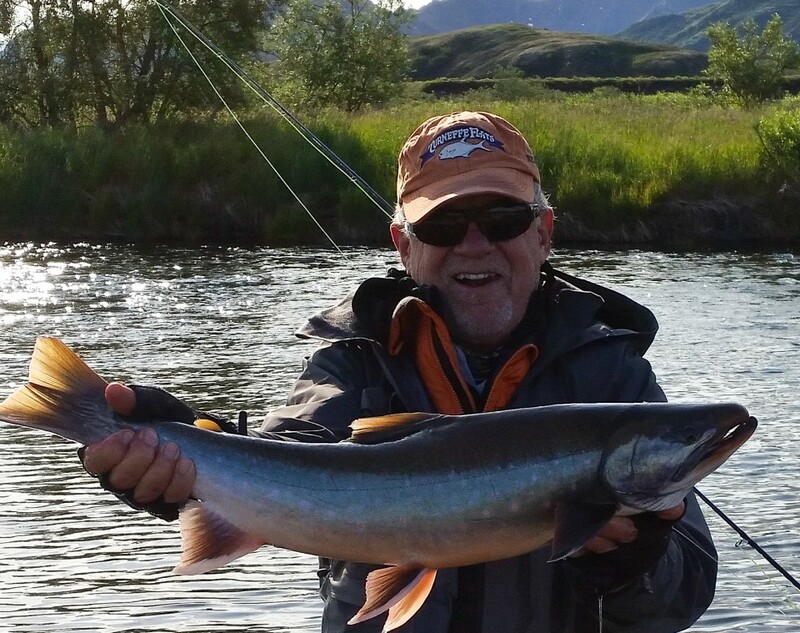 Scott Slappey Sr. took in excess of 21-trophy Char that first night. These were Char with “shoulders” that completely overwhelmed the 5-6 wt rods we’d set up for the upper river. These were Char that you didn’t remember unless they were over 22 inches and some were pushing 26-28 inches. These were girthy fish that resembled summer run steelhead in stamina. Pandemonium ensued with multiple hookups and there was a distinct shortage of “friends” available to net for you as the evening progressed. 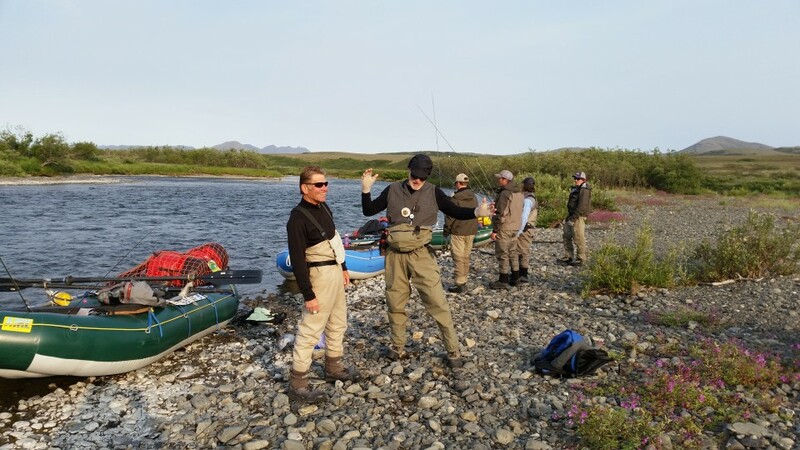 From the trip log of July 20’Th, 2014: I fished with Scott jr. and Jon Trachta and the fishing was extraordinary and would be the capstone of any anglers week had not the breakfast Brown Bear “event” taken center stage. Jon Trachta had taken an unbelievable 28” inch Char as we waded after breakfast before loading the rafts. Gary Smith, & Scott Slappey took fine fish too- in fact everyone did. 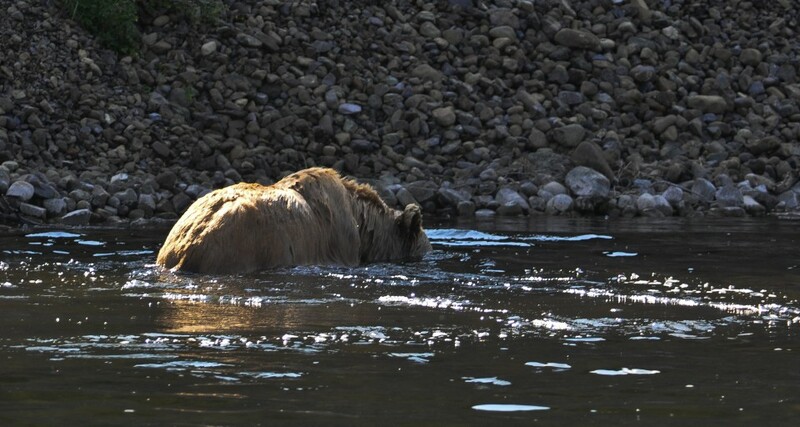 Will Tully and his grandfather Ken Emanuels were doing well and then word came from down river that a young brown bear was approaching so we gathered our group together to see what the bear intended. 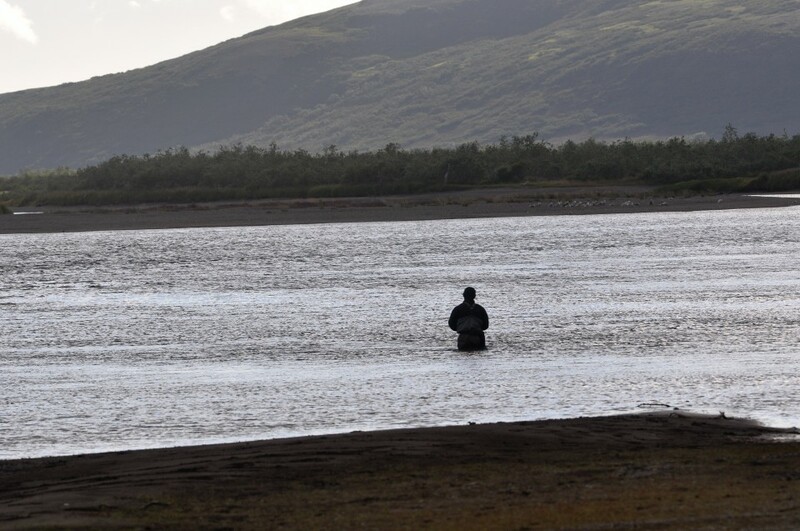 He intended to walk past camp and we slowly backed away from the fishing to allow his passage. When the bear veered off to investigate some of our camp gear the guides objected and called for reinforcements to haze the bear from camp. As it turned out the only reinforcement needed was Scott jr., a college baseball player who persuaded the animal to move off with a well-thrown stone. It was an athletic display of a young ball players gift. 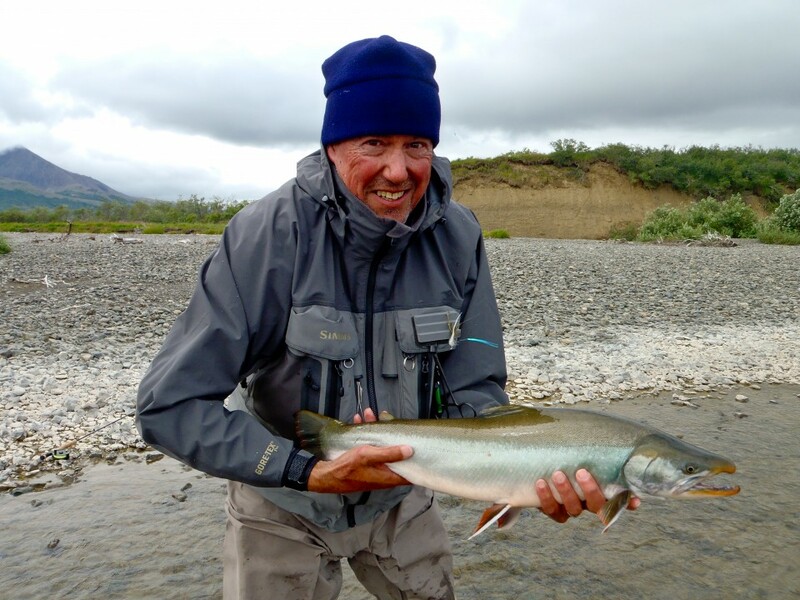 We fished to a congregation of Dolly Varden Char just above a bluff that Brown Bear frequent and then we fished down alongside the bluff to the end of the pool. The number of Char arrayed among spawning salmon was incredible especially at the tail out of the pool. We finally moved on because we’d kept a young brown bear from fishing the run for a bit and that young angler deserved a chance. 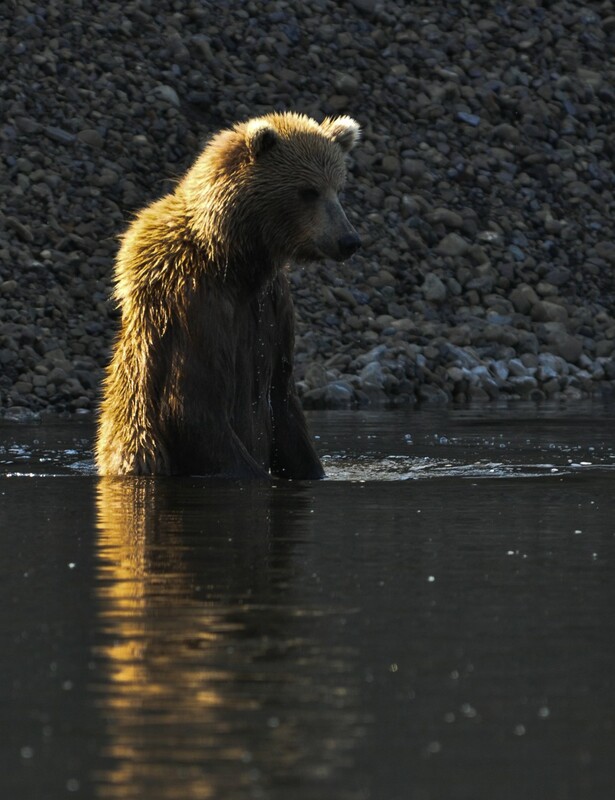 It’s wonderful to watch an intent young bear work a pool for salmon. 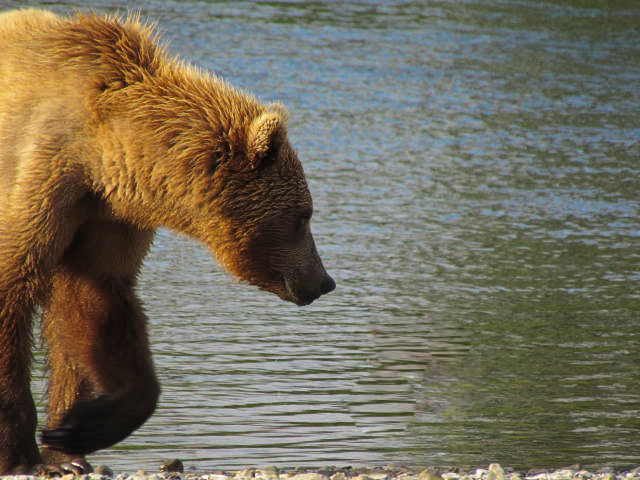 This bear walked the bluff looking down then entered the river and stood up to spot salmon. Next it “snorkeled” with eyes underwater searching for fish. Unsuccessful it exited and shook like a dog, then climbed up the bluff to look down again. Rafting down the canyon reach of the Goodnews- the fishing stayed unusually strong. The upstream migration of Char and our downstream fly fishing and rafting intersected in a perfect drama of bent fly rods as thousands of Char surged upriver. From the trip log of July 21’st, 2014: ”Ken Emanuels and his grandson Will fished through the middle reach of the Goodnews with me. The middle reach begins to develop channel structure where long sweeping bends with Willow and Cottonwood and tangled roots overhang and collapse into the river. The woody debris creates Rainbow Trout habitat and the fishery becomes more diverse. Will turned to me and said, “I’ve released more fish in the past three days than I’ve caught in my entire life, combined!” Imagine how you’d feel as Will’s host, his grandfather, Ken sat next to this fine young angler? Ken watched Will working on smoothing out his cast, getting more distance, and getting lot’s of practice setting hooks and fighting fish. 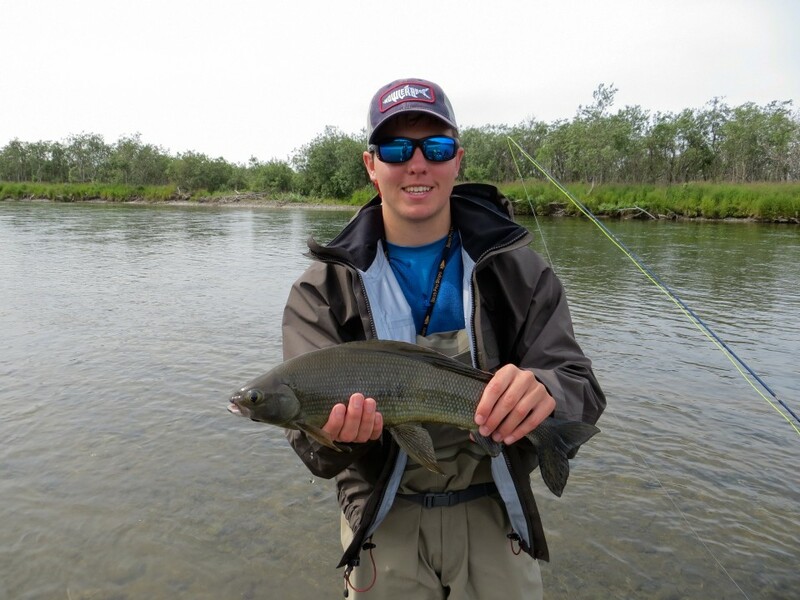 A staggering 60 Char and trout were released in our boat as well as Will’s first salmon! As a father I have a special place in my heart for our guests who bring their children. All the guests got a chance to fish with Scott’s sons and we watched them both progress in skill and intensity over the week. I made a special note on July 23’d that “Sam was casting streamers with confidence and took both trophy Rainbow and Grayling”. There is very little that is easy about catching the trophy Rainbows of the Goodnews. They generally stay deep in cover and getting the streamer into the woody debris is essential. 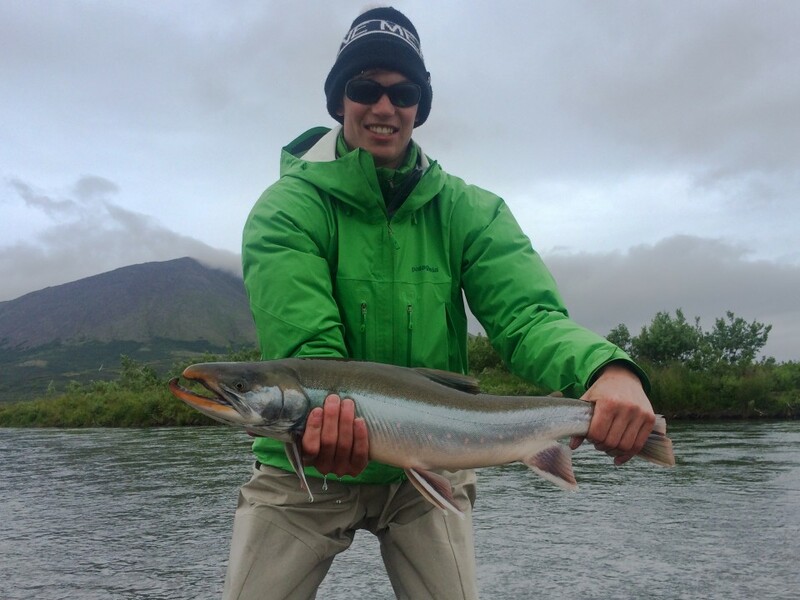 Sam was definitely on his game when he hooked and landed those spectacular fish with me! From the trip log of July 22’nd, 2014: “Rain, fog, and drizzle with Loons wailing and Sandhill Cranes chortling in the distance. John Michaels & Jon Trachta and I passed the time as we searched for fish casting Flesh flies, trout beads, and streamers. All the patterns took fish. The hours went by and some remarkable aviation stories were told of F-4 missions and naval aircraft carrier landings from the Viet Nam war.” Trachta and Michaels had some “issues” to work out about casting over each other’s lines and the boat rocked with hilarity. You’d have to ask them for the details. We built a camp on a grand bar with a territorial view.” My notes say it was Gary’s inspiration. He collected driftwood for a campfire. Scott Jr. took a lovely bright Sockeye and upon seeing it the chef proclaimed it “Sushi night.” After 5 days of travel and countless fish we had time for a modest celebration. 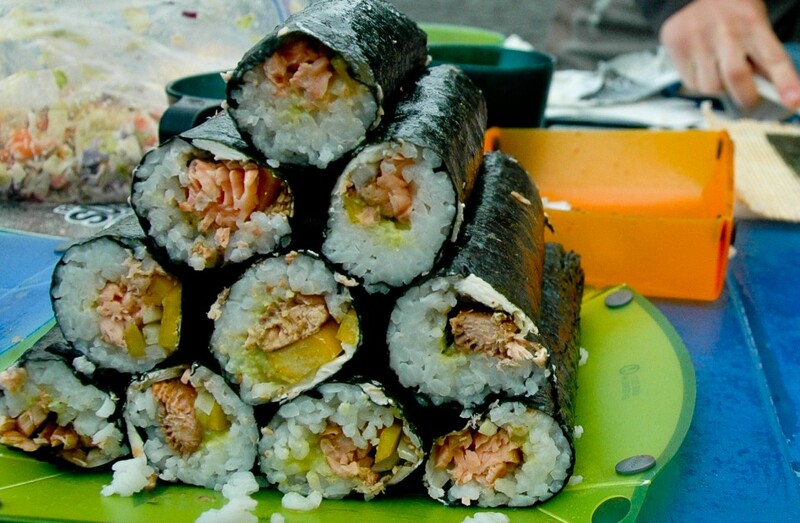 We ate smoked Salmon appetizers next to Gary’s campfire while guides Brian & John steamed sticky rice, lightly cooked the Sockeye, then rolled Sushi. Sushi on the river is such a treat. The fish must be in perfect condition. The anglers crowded the sushi table like hungry wolves. From the trip log: Anglers commenting in camp at breakfast about “the Beaver that slapped it’s tail” alarmingly throughout the night. Then, the morning Ravens did a “fly by”. A pair of the large black birds uttering something like “Conk, Conkle, Conkler”. 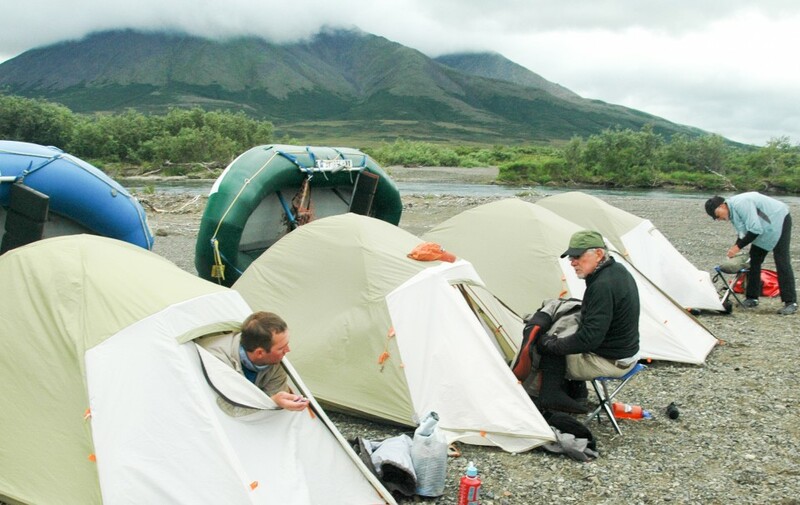 Each camp was different as we moved down river and they each had different wildlife. 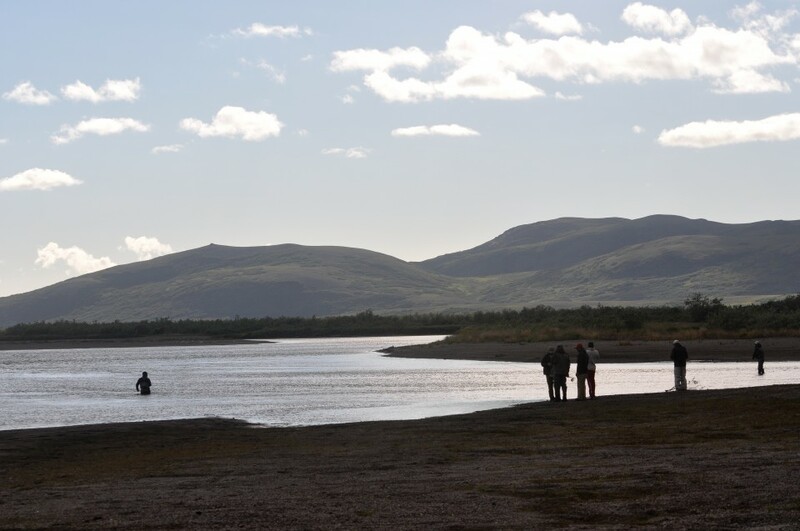 The landscape around the camps of the upper river was alpine, the views constrained by the mountains and the camps built on modest gravel bars. 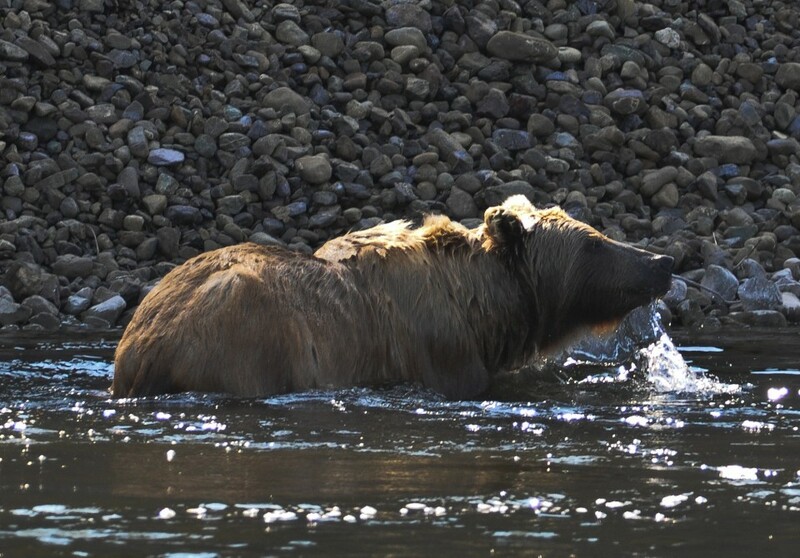 We saw more bears fishing along the upper river in part because the salmon spawning in the alpine shallows are easier targets. In the middle reach of the river the views encompass the entire watershed from headwater mountains to the coastal plain and waterfowl, loons, and Sandhill Cranes trade between wetlands across the horizon. In the lower river the Goodnews valley gathers more tributaries including the Middle Fork and meanders across the floodplain. Multi-generation Beaver lodges are seen behind dams built across riverside wetlands. Mew Gulls, Glaucous-winged Gulls, and sandpipers like Greater Yellowlegs dominate the gravel bar birdlife in the lower river. By now with miles of river behind them and thousands of casts, the anglers each had a good understanding for the Goodnews fishery. 50 miles of casting and reading the water had passed under the rafts. The casts were efficient in ways that earlier in the trip they could not have been. When a week is spent on the river one deepens your understanding of all the species. You’ve learned in which habitat Char will be found, which water holds Rainbow, and how the salmon stack up below islands. The numbers of Char taken that day along with Rainbow, Pink & Chum Salmon were sensational. In the lower river the water slows and develops huge sinuous ox-bows and side channels. We explored sloughs, seams of current below islands and the V-wakes created by fresh pods of salmon and char were cast to. Each mile held more incoming salmon. The week with the Slappey family and Gary Smith’s group was exceptional.